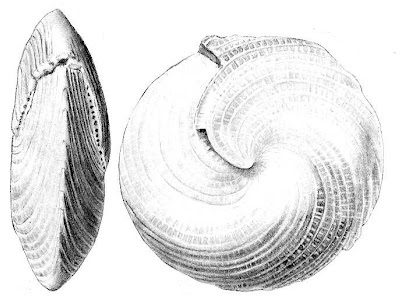 Side (left) and apertural views of Fallotia colomi, from Loeblich & Tappan (1964). The Meandropsininae are a group of porcelaneous Foraminifera known from the Upper Cretaceous and Palaeocene (Loeblich & Tappan 1964). Characters (from Loeblich & Tappan 1964): Early stage planispirally coiled, later may be discoidal, operculiform, flabelliform, cylindrical or conical in shape; subepidermal chamberlets in marginal zone, with interseptal pillars; aperture commonly cribrate. [LSM-CG00] Luperto Sinni, E., J. Martín-Chivelet & R. Giménez. 2000. Praemurgella valenciana nov. gen. et sp. (Foraminifera) in the Sierra de Utiel Formation (Coniacian–Santonian) of the Prebetic domain (SE Spain). Geobios 32 (2): 145–151.